Sydney Smith is a senior at Covenant College, a small, Christian college in Georgia, where she is majoring in psychology with a minor in history. She says that it is the right place for her, but without a high school advisor who helped her sort out the FAFSA form, she might not be there today. “[Covenant] is private, it costs a lot to go there, and without my advisor, I might not have known which scholarships to apply for and which forms to fill out,” Smith said at a briefing Tuesday on the FAFSA at the Senate Office House in Washington, D.C. The event was organized by the National College Access Network (NCAN), a D.C.-based nonprofit that works on issues of college access. Filling out the FAFSA was a complicated process that took more than a week to complete, Carlos Jimenez-Vasquez, a freshman at Appalachian State University majoring in business management, said at the briefing. “The FAFSA was just a riddle that had to be solved,” he said. Since its creation, the FAFSA has moved online, which has helped simplify the process somewhat, since applicants and their families can now import data from the IRS, provided that they filed taxes the previous year. Despite improvements, the form still has numerous critics, including members of Congress. Tennessee Sen. Lamar Alexander, who chairs the Senate committee on education, is known in education circles for his dogged efforts to reduce the form to a few simple questions. Speaking at the NCAN hearing on Tuesday morning, Carrie Warick, director of policy and advocacy at NCAN, argued that simplifying the FAFSA would make higher education more broadly accessible and give students better information about whether college is financially feasible for them. If they do not fill out the form, students do not have access to key federal aid programs, such as Pell Grants, which go to low-income students. The Pell program disbursed approximately $28.2 million in aid to 7.6 million students in 2015-16. To assess how a more user friendly version of the FAFSA might impact students, NCAN developed a new model, which it calls the Streamlined FAFSA, to compare against the existing form. The Streamlined FAFSA trims down the existing form, eliminating questions that NCAN deemed to be redundant, and guiding users down three potential pathways dependent on their families’ financial backgrounds. “[We want] to stop asking low-income students to prove over and over again that they are low income,” Warick said. In NCAN’s vision for the FAFSA, applicants who come from families who receive federal means-tested benefit programs, such as SSI, SNAP, TANF, and WIC, would skip the financial sections of the FAFSA. Those who come from moderate and middle-income families would also receive a slightly different set of questions. The Streamlined FAFSA would also allow states to opt in or out of the “State Page,” which collects information on applicant eligibility for state aid. 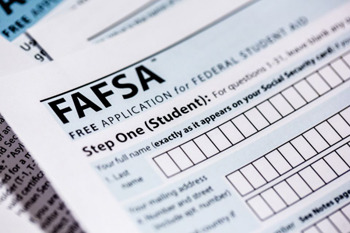 According to NCAN’s analysis, the FAFSA could be reduced to a maximum of 69 questions, which NCAN said would not only be faster to fill out, but also result in substantially fewer applicant errors. Yet until the FAFSA sees a dramatic overhaul, which would require Congressional or Department of Education action, the best and perhaps only answer to addressing some of its perceived weaknesses is a boots on the ground approach. High school and college counselors play a major role in communicating FAFSA requirements and deadlines to students, to ensure that they submit the form correctly and on time. At many public schools however, counselors are swamped with students. On average, there was one counselor per 470 students in 2013, according to NCES data. In California and Arizona, the numbers were far higher, with one counselor serving more than 800 students on average. “There aren’t enough of us doing this kind of work in schools,” said Dr. Yolanda Watson Spiva, president and CEO of the College Success Foundation (CSF). The foundation is headquartered in D.C. and works with low-income students to help them apply for and complete college. CSF works with students from a wide spectrum of educational achievement, but Watson Spiva notes that students attending schools with limited resources may receive less support if they are not at the top of their class. “With limited resources, you have to focus on the top 10 percent of students because they seem to be the most likely to go to college,” she said. By focusing primarily on top performers, many students who also have a shot at a college degree are left behind, she added.